The whereabouts of Andhra Pradesh Chief Minister Dr Y S Rajasekhar Reddy remain unknown, several hours after his helicopter went missing over the deep forest areas in the southern region of the state. "There is no good news yet. We are keeping our fingers crossed," Home Minister P Chidambaram said. The twin-engined Bell 430 AP helicopter with the 60-year-old chief minister on board took off at 8.45 am and was scheduled to land at Chitoor district at 10.45 am. However, it soon lost radio contact and has been untraceable. The chopper is said to have landed in the middle of a thick forest, which is infested with Maoists. Reddy, who led Congress to an impressive second consecutive victory in the Lok Sabha and assembly elections in May, was reportedly undertaking a surprise visit to the villages in the Chitoor district. The proposed tour was kept under wraps for security reasons. The other two officials accompanying him were informed just two hours before the scheduled departure. According to the private channel, Reddy told media persons in the morning, just ahead of leaving, that he was undertaking a surprise visit. "The objective to undertake such a visit was to reach out to the villages. 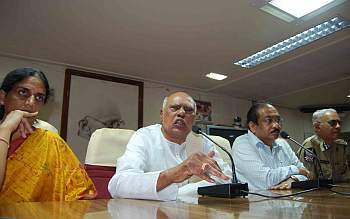 There is need to ensure ration card and water supply," said Reddy just before leaving. As per latest reports, aerial search operations have been called off. However, 5,000 personnel of the Central Reserve Police Force and Indian Army have been deployed to search for him in the forest ranges of Chitoor and Prakasham districts. Meanwhile, Congress President Sonia Gandhi has asked Union Law Minister M Veerappa Moily and Minister of State in the PMO Prithviraj Chavan to rush to Hyderabad to assist in the search operations. 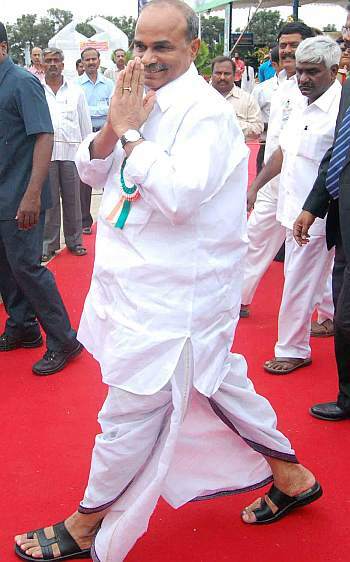 If need arises, Chidambaram will himself rush to Andhra Pradesh, he said. Air Traffic Control sources said the chopper went off the radar due to heavy rains. 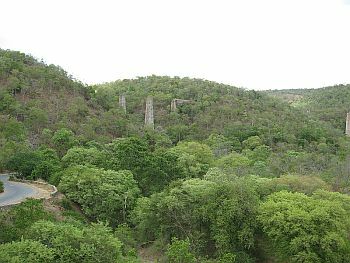 Two helicopters from Hakimpet air command in Secunderabad returned because of inclement weather while three from Bangalore air command and one private helicopter from Nellore were involved in search operations mainly over the Nallamala forest ranges, a stronghold of the Naxalites, in the Rayalaseema region. The incident has sent security agencies and bureaucrats into a tizzy with top officials closeted at the secretariat in Hyderabad to monitor the situation. State DGP S S P Yadav and Intelligence Chief Aravinda Rao and Chief Secretary Ramakanth Reddy are supervising the operations to trace the missing chopper. Andhra Pradesh Finance Minister K Rosiah confirmed that the chief minister's helicopter landed in a forest area in Chitoor district, and efforts are on to locate it. Addressing a news conference, Rosiah said: "All state and central forces are on alert. At the moment, we are still tracing the location of the missing chopper, which has landed in the forests in the Chitoor-Nellore area. We are finding a way to reach the place." Rosaiah appealed to the people in Chitoor, Mehbubnagar, Prakasam and Kurnool districts to provide any information they have on the missing helicopter. Police and forest departments in the area were coordinating the operation. Rosiah said that the Prime Minister's Office as well as the offices of Congress president Sonia Gandhi, Home Minister P Chidambaram and Defence Minister AK Antony are being kept posted about the latest developments. 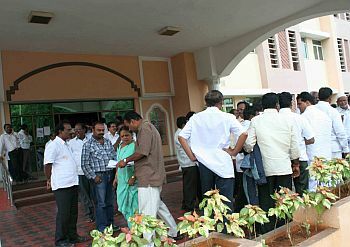 Rosiah's briefing came as Andhra Pradesh Police continues their search for the missing chopper of the chief minister. He said the Prime Minister's Office, Union Home Ministry and Defence Ministry have been alerted while the office of Congress President Sonia Gandhi was in touch with the state government. 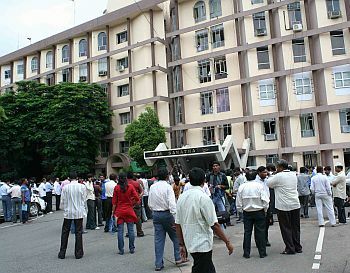 The Home and Civil Aviation ministries in Delhi have also said that no contact has been established with the missing helicopter. Chief Minister's Principal Secretary S Subramanyam and Chief Security Officer A S C Wesley and two pilots were also on board the twin-engined government helicopter. While he expressed hope that the chief minister could be safe, state Chief Secretary P Ramakanth Reddy said it could be possible that the helicopter could have landed in an unfamiliar area from where getting out could be difficult. "So far we have not been able to make any contact. It is possible because of strong winds and inclement weather, it may have landed in an unfamiliar area from where getting out can be difficult. Time we have before sunset is limited and it is raining heavily," he said. 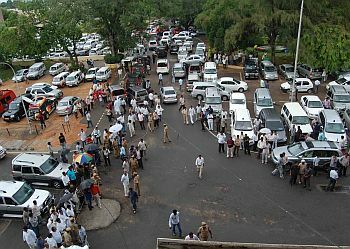 Meanwhile, Congress President Sonia Gandhi has expressed concern over the incident and is monitoring the developments. Party spokesman Manish Tiwari informed media persons about the same. Describing the situation in Andhra Pradesh as a 'crisis', he said Gandhi and her office were monitoring the developments. The Congress President hopes and prays that Reddy is safe and would return to work soon, he said.